Sometimes we are saved from our own thoughtless enthusiasm by the well-intentioned fates. And then, when we’re flexible enough to allow intervention and change course, we are rewarded. 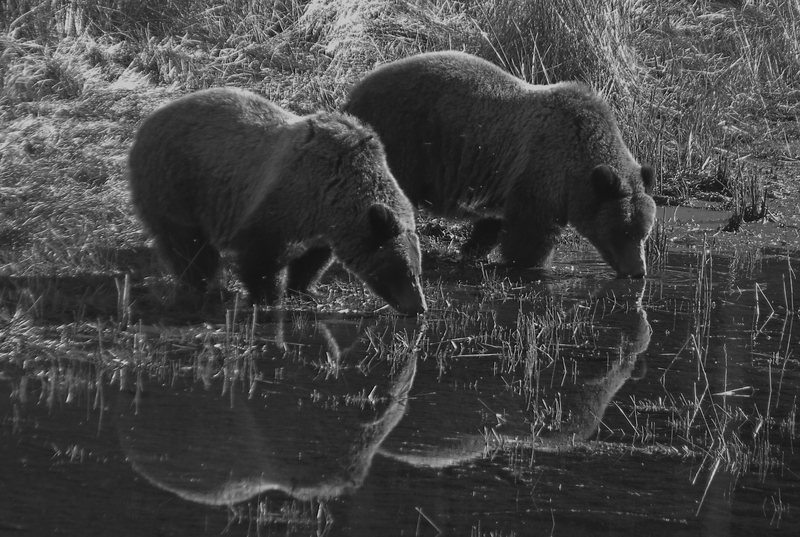 In September 2013, I found myself bailing out of a week-long backpacking trip planned months before and into a thought-provoking grizzly watching experience standing shoulder to shoulder with nationally known wildlife artists. We were going to backpack the Heart Lake Loop in Yellowstone National Park, Brenda and I, embarking in September on a trip with 5 nights of camping, a climb of Mt. Sheridan, a few river fords made safe by the drought and late season. I wanted to visit another section of Yellowstone, having packed into the Black Canyon of the Yellowstone and Slough Creek up north. Heart Lake is the civilized trip; Two Ocean Plateau is the way-out-there wilderness backpack I wanted to do next. Brenda, a Jersey native gone Western long ago, loves Yellowstone passionately and volunteers tirelessly for the park. Brenda had packed, repacked, and repacked again, fretting over the weight of her pack and food that would not fit, until 12:00 noon, far later than we intended to start down the trail. It was warm and we were tired from sitting up the night before at her house, gabbing. Almost at the get-go, Brenda crumpled to the ground with a torn muscle, stiff from a backpack the week before and overstressed by her heavy pack. She was distraught half by the injury, and half by the prospect of ruining my long-standing plans, and tried to stand and keep moving, with the same awkward result. I am absolutely opposed to having anyone try to persevere injured for my entertainment, and firmly announced it was time to quit. We went back to the ranger station where the park ranger on duty suggested she get some medical attention, and that I abandon my plans. 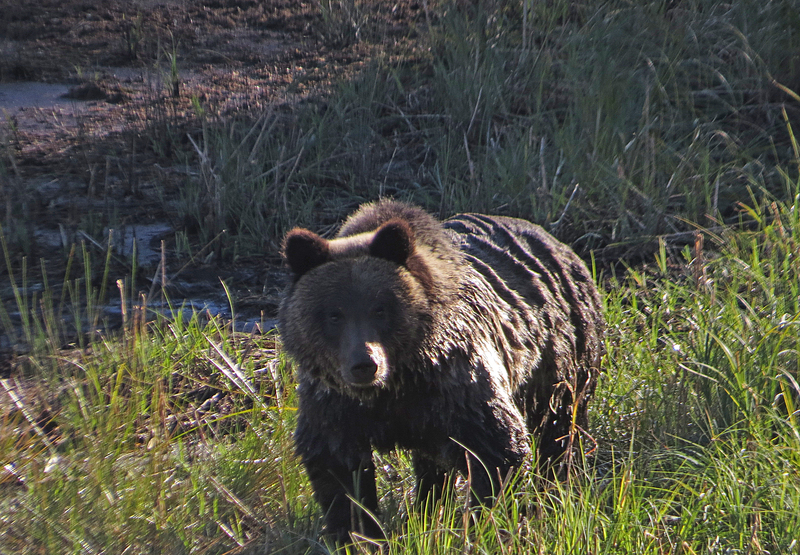 In grizzly country, Yellowstone does not like to hand out permits to solo travelers. Brenda is a nurse and should know better; she decided to wait it out and change plans. Some old friends from Denver were in the area, a group of bicyclists making an annual ride and an artist friend, in for the National Wildlife Art Museum annual show and some wildlife photography and plein air painting. 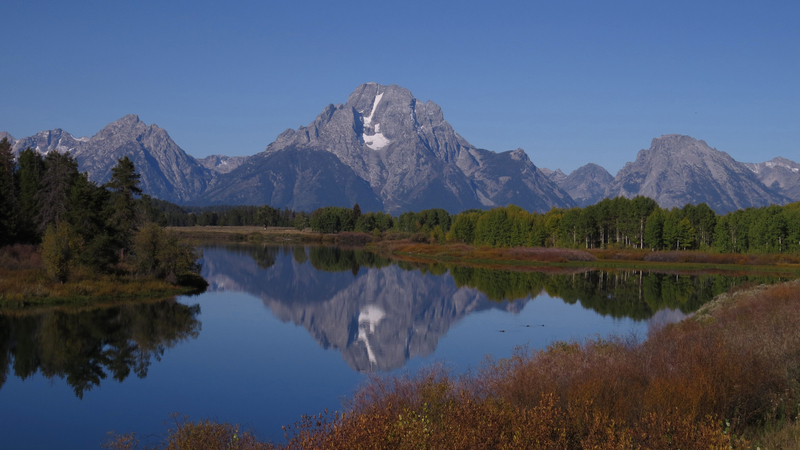 We thought we might hang out in Yellowstone, but when we hit the roadway and saw the sign for Grand Teton, we threw plans to the wind and turned south. The diversion in plans was fortuitous, since the skies opened up for next few days with sometimes violent thunderstorms and serious warnings for this area broadcast on the radio. One night, lying in the tent below tall trees, the tent wall suddenly lit up with a flash of lighting. Before I could say “one one thousand” thunder exploded above us, vibrating the tent walls. Torrents of rain pelted the tent. 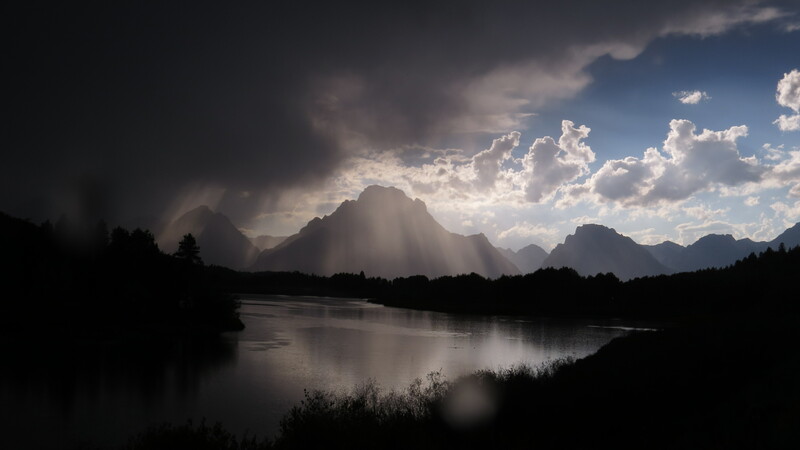 The thunderstorms swept through, chasing each other like gods in some otherworldly battle game. 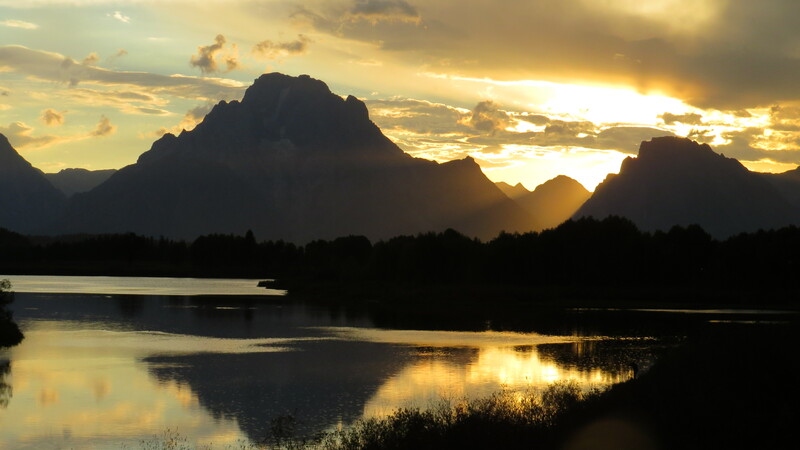 We stopped at Oxbow Bend and found ourselves running for cover in the car, then emerging 10 minutes later to view a shimmering sunset of bronze, copper, and gold. 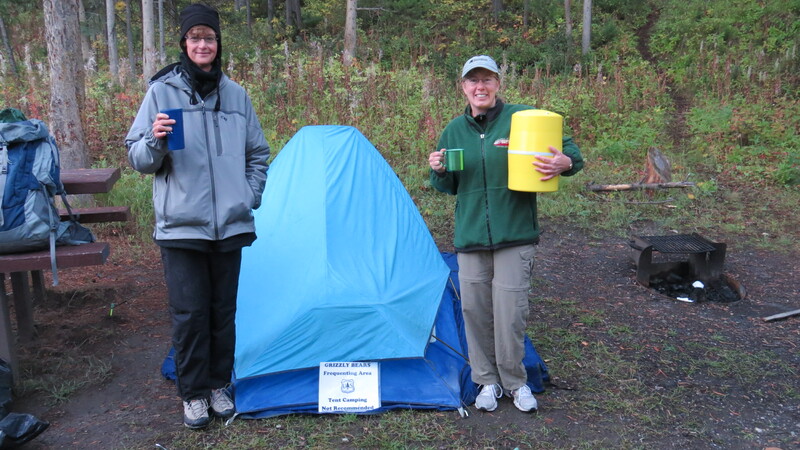 That week of backpacking would have deteriorated into an exercise in misery, sodden and stinky gear, and friendship-destroying crabbiness due to being tentbound with wet, rank-smelling gear. That type of trip is best done solo as penance or self-discovery. That night, Brenda’s bicyclist friends arrived late, soaked and cold from an ascent and descent over the 11,000 foot pass. They all had dinner together at camp and talked for hours. I was tired from days of driving, late nights, the aborted trip, too much work before I left, a friendship going south as my friend imploded his own life, and so on. I lay in the tent instead of visiting, listening to the rain, the voices, drifting in and out of light sleep. On the first stormy day, we dodged in and out of severe thunderstorms on the drive to the National Museum of Wildlife Art outside of Jackson to view the annual Western Visions show (http://www.wildlifeart.org/). 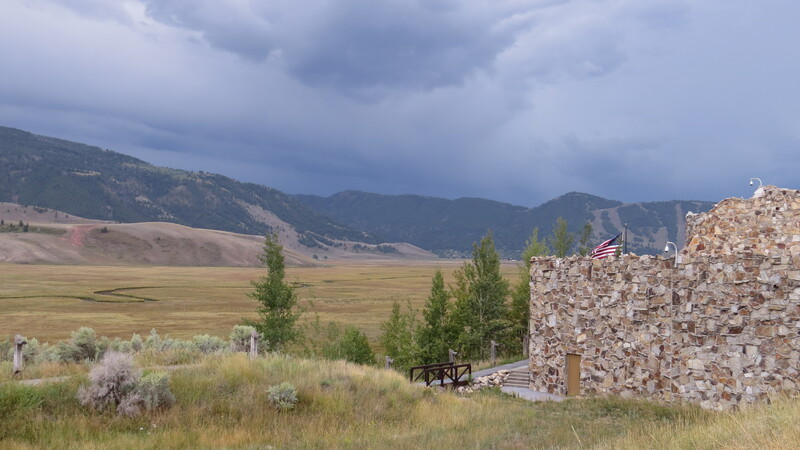 The architecture of the museum is the first piece of art you see, a wood and stone structure artfully designed to evoke a rock outcropping on the hill above the refuge. The sculpture path winds around the facility and across the ledge, a dramatic and most appropriate setting for large scale animal sculptures. A bull moose appears to be walking down the path as if we had stumbled across him on a trail. The interior is loftier and more spacious than the exterior promises, modern yet organic in feel. The museum does a wonderful job of education and interpretation. I learned that wildlife art became so popular in America because here, anyone could hunt, whereas in Europe, it was the privilege of the titled only. Struck as I was by my own loss of a disintegrating friend, I found my face stiffening to avoid tearing up at a sculpture of an old, injured elephant bull being helped by his comrades (a true scene, apparently, and chosen to reflect the World War raging around the artist). The signage pointed out the license taken to show family groupings that never exist in nature, where un-Christian promiscuity is the norm and males frequently run off and leave single mothers to their own (much to the relief and sometimes insistence of the single mothers). My favorite wildlife artist is internationally renowned Robert Bateman, whose charismatic bison bull, “Chief” embodies to me the power of 65 million bison that once roamed North America. His works are tremendously atmospheric and sometimes challenging to view, like the seal entangled in driftnet, and dead, oil-soaked birds. Like author Edward Abbey, Mr. Bateman is in his own way unapologetically curmudgeonly about our assaults on the natural world, unrelentingly devoted to nature, and I admire him for that. Bateman was long ago reviled by other artists for apparently oversaturating the market with art and prints, though for most of us, his reproductions are our only opportunity to bring wildlife art of that caliber into our homes. And for some, those prints are an inspirational reminder that pushes us to go to museums and buy memberships, to contribute to foundations, perhaps someday to buy an original. To hell with the kerfluffle about reproductions- I am glad such a visually strong advocate for wildlife has been able to earn a living at it. Brenda and I moseyed through the museum, lulled into that museum stupor that eventually occurs when brain and eyes are full. We made sure to find her friend Bill’s painting and sketch, and I looked for Joshua Tobey’s sculpture and Lindsay Scott’s drawing. Then we went to lunch and talked some more before returning to camp and meeting up with Bill, who shared our site and camped in his truck. With another stormy night, I envied his sleeping space. I did set out on a backpack alone, since Grand Teton is the Wild West compared to Yellowstone and had no problem issuing a solo permit in bad weather and bear country to do the Paintbrush Divide/Cascade Canyon loop. I hiked up in deteriorating weather, passing an exhausted young guy who said he camped in the thunderstorm and snow at Holly Lake, barely slept, and gave up going over the pass. I did pretty much the same; with backpacking boots, no ice axe, and no buddy, I figured the 4 inches of ice on my tent was a sign to enjoy a nice hot breakfast and mosey slowly out to Jenny Lake, enjoying the sunbreaks along the way. 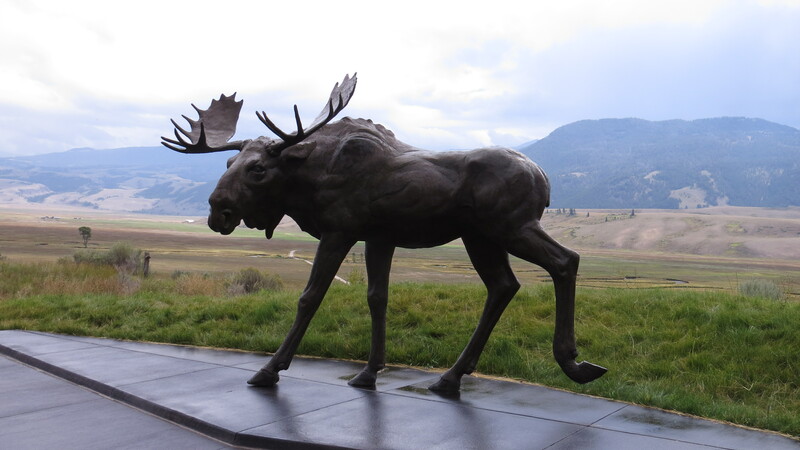 Brenda and I met up and she told me how she and Bill found moose by Gros Ventre, how he was traveling around in a dispersed group with several of the artists, all calling one another to signal a wildlife find. And late that night, the call came. Three grizzlies, maybe 2 1/2 years old, on a moose carcass. Not going anywhere too fast, but had been there a couple days, so no telling what was left. 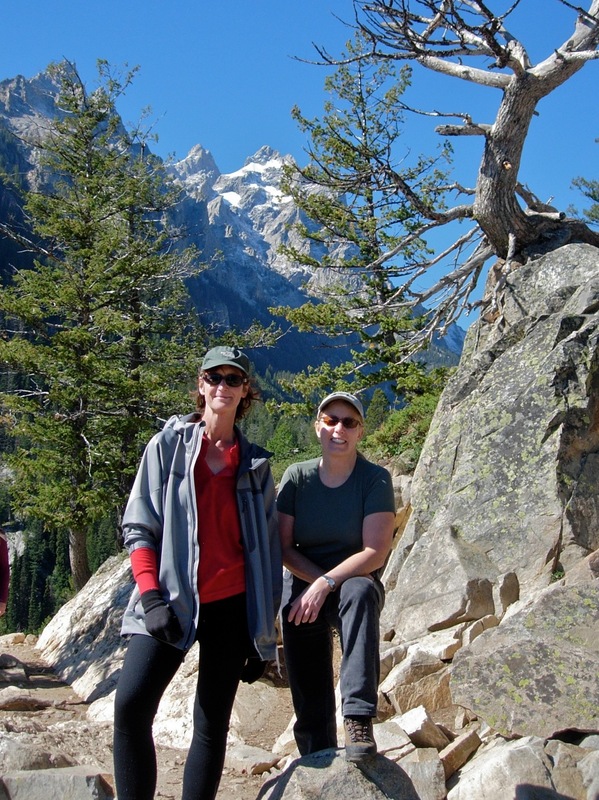 Brenda wanted to take the boat across Jenny Lake and hobble, still sore, up the trail. Anxious to see the grizzlies before they left, I bolted up the trail to wear off some energy, then turned around and met Brenda. We packed up and headed out to find a campsite, then the grizzlies. 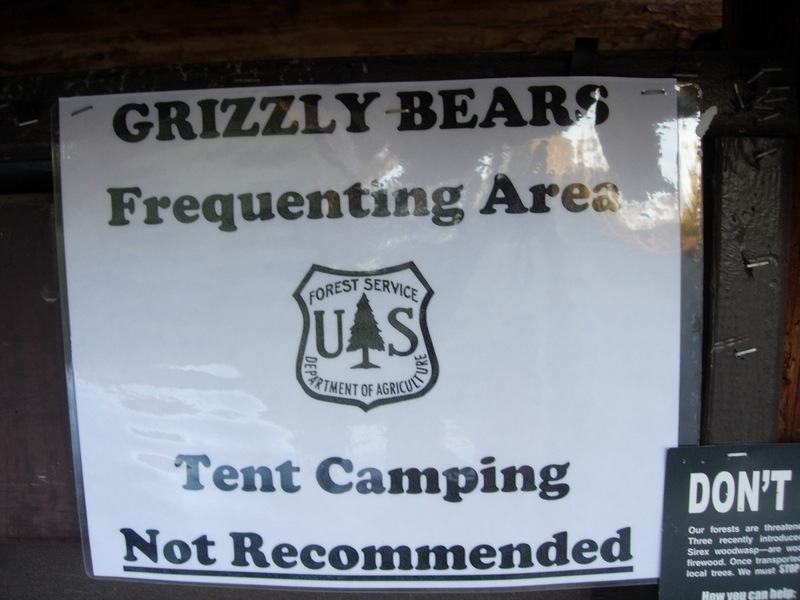 The Forest Service campground was marginal, by the highway, and plastered with signs warning that it was a grizzly bear frequenting area, and tent camping was not recommended. Since it didn’t say “not allowed”, we went for it. And then we headed up the road to the scene, looking for Pete Zaluzec, an artist Bill says is unmistakable for his resemblance to Santa Claus. Santa Claus was not the artist Pete is, but the description helped us find him instantly. Pete and Bill said we missed the morning’s excitement, and arrived in the heat of the day as the bears slept in the shade near where they had buried the carcass. This was my first real field lesson in grizzly signs: if I had been hiking by, likely hot and wearing sunglasses and not seeing too much around me, I might never have noticed the dug-up dirt by the tree. The ravens were quiet, so I would have cruised right by, and like one hapless coyote, found myself confronted by a large bear exploding out of the shadows to defend its food. The coyote was faster than I could ever be, so it survived. If I had approached from the other direction, I would have simply tripped over them and likely paid dearly for that little surprise. The bears eventually did as they had for days, and rose to pass through the woods to a pond on the other side. That’s when things became even more educational. We drove around a corner to the ponds and found a line of cars forming. Word of mouth spreads rapidly among artists and local grizzly watchers. And these were famous bears, two of them cubs of Bear 610, one of them an adopted cub of her mother, Bear 399. 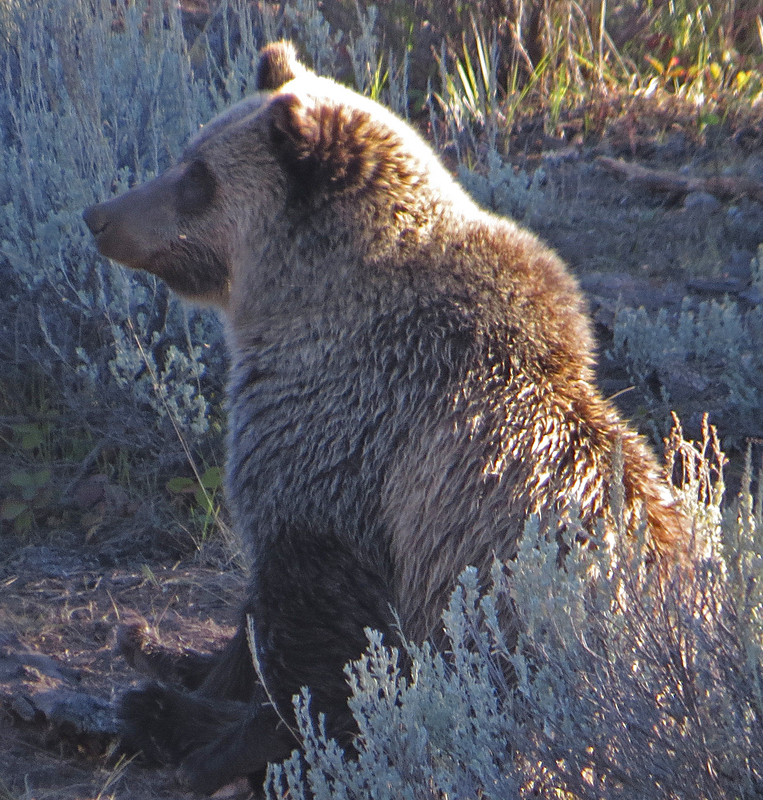 Bear 610 is the last of Bear 399’s cubs, the rest removed for cattle predation. I find this out because a few SUV’s show up with stickers that say, “I saw Bear 399” and “I saw Bear 610”. And when a Wyoming Fish and Game Biologist shows up, the owners, women with Germanic accents, hiss at him loudly: “Zer is zee babeesittah, come to vatch zee babees.” I think it is a joke, but he says not so much. The roadside bears have become habituated to people, too habituated. Defenders of Bears 399 and 610 have followed the bears diligently, perhaps meaning to protect them from removal. This has backfired a little, with the cubs ending up between to lodge buildings at a resort recently. They were hazed with firecrackers and rubber bullets. Fortunately, a hunter shot this moose and took only backstraps and roast, said the biologist, leaving the rest for the cubs, who smelled it from 5 miles away and came up from town. They are still at risk, he says, and need to stay away from people. “All they need is for one of these people to drop a lunch, and it’s over,” he says. “These bears are one peanut butter sandwich away from death.” He says he’s not an enforcement officer, so he can’t do much to keep people away. The cubs were weaned this year at 2 1/2 years old, coming out of the den thin. The biologist said everyone was surprised they made it on their own. They have fattened up on a good berry season, and if they can den up without too much trouble, they will disperse next year and hopefully stay wild. The biologist is driving a worn work truck, accompanied by his dog, a terrier type obsessed with a slimy rubber ball. The biologist is driving around posting signs on trailheads because there are six grizzly boars in the area on carcasses, and they’re in a mean mood, even charging people on horseback. He came to this site because a hunter reported that the line of cars was blocking the bears from reaching the cleaner of the two ponds. It’s that time of year for the bears, where they’re putting down 20,000 calories a day to make it through the winter. It’s also the hunting time of year, when successful sportsmen and women are leaving gut piles that attract bears, or even partial carcasses like this one. Hunters are out there on foot and on horseback, and confrontations are occurring as a result. 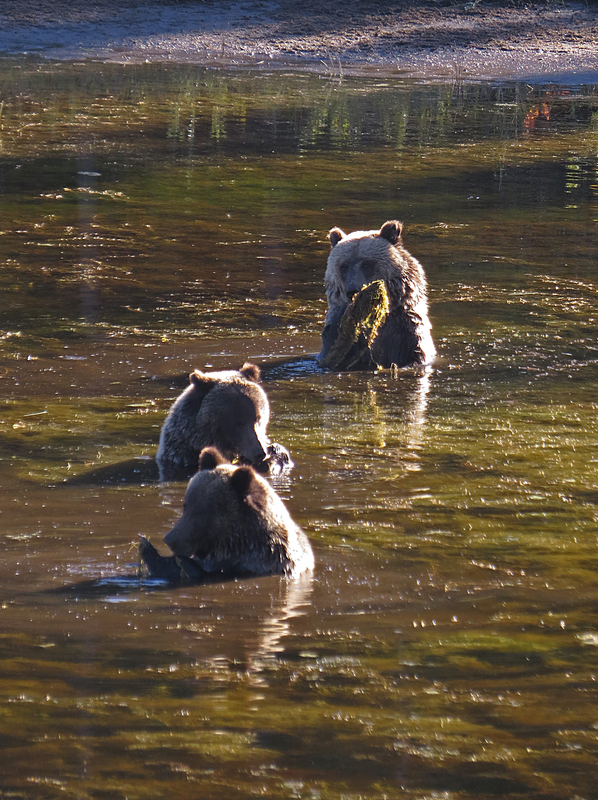 The unwary bears come out of the trees and drink from the pond, then wade in and appear to be playing with submerged logs and pond weeds, sometimes moving in a sort of soggy bruin synchronized swimming routine. There is a little play swatting, splashing. One bear, chocolate colored, gets out of the pond. I keep watching the bears in the pond, figuring he has gone into the woods. I am on the edge of all the important artists and wildlife watchers, feeling small with my tiny super-zoom and artistic anonymity, really just an intruder. And then I look up and see that the bear has circled around the pond and is standing 50 feet away from me, staring. “Uh, bear on the right,” I say nervously, wondering whether the bear would really charge a crowd of thirteen. “Where?” says a photographer, whirling around with a huge lens and tripod. The bear turns and walks toward the woods. I have learned one more lesson taught by the couple who got attacked in 2010 on the Mary Mountain Trail in Yellowstone: never lose sight of a bear in the area, watch for it to circle back on you. He died for this mistake, she escaped. A French television crew has showed up by the forested area to film the bears. They were making a documentary in Yellowstone and Grand Teton and got word of the bears. I wonder what they will say about these bears. Are they giant, frightening predators, waiting to prey upon the unwary hiker or hunter with fang and claw? Or are they increasingly depleted large mammals caught between the wilderness and our predator-intolerant civilization, walking the thin wire between wildness and a familiarity that will mean certain death for them? We treat Bill to dinner at the Hatchet Resort, delicious pan-fried trout, and talk mega-history. 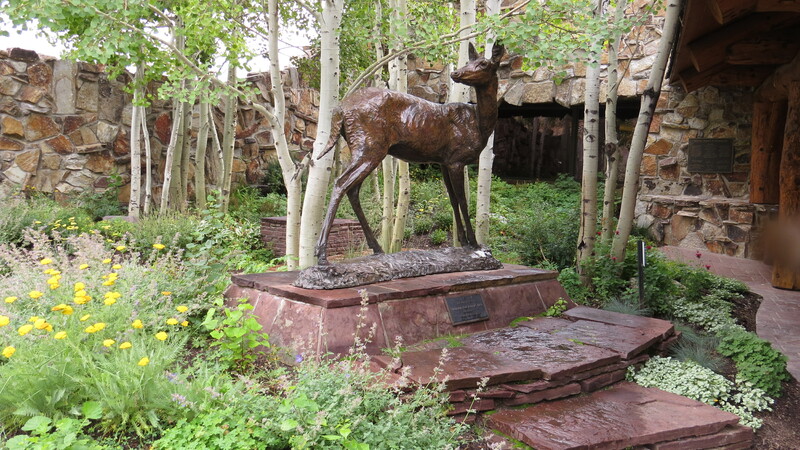 Bill was a zoologist at the Denver Museum of Natural History before he became a full-time artist. Besides having a finely developed understanding of animal anatomy, his experience has given him an expansive perspective on the planet, reaching across time immemorial and so stratospheric that barely visible are the specks of three cubs, a few artists, and a couple nice pan-fried trout dinners. He says we may tear the skin of the earth apart, send streams of poisons across the land and into the waters and atmosphere, but the planet will heal itself when we finally do ourselves in. The earth may look different, he says, but it will persevere and sew itself back together again. It is just too large and too deep and too powerful for us to really change it much. And on that lofty note, we pick our way along the highway to Hatchet Campground to sleep easily despite the bear warnings, knowing that the cubs are resting far away, near a natural food source all their own. Thus ended a week that was supposed to be an adventure in backcountry travel and navigation, but instead, became one more skipping stone in a stream of perspectives on our human experience in a natural world.